I lived in Melbourne for many years. I loved living there, walking along the Yarra River to work while rowers glided past and cockatoos swooped and shrieked in the eucalypts, the city a gleaming array of towers on the opposite side. 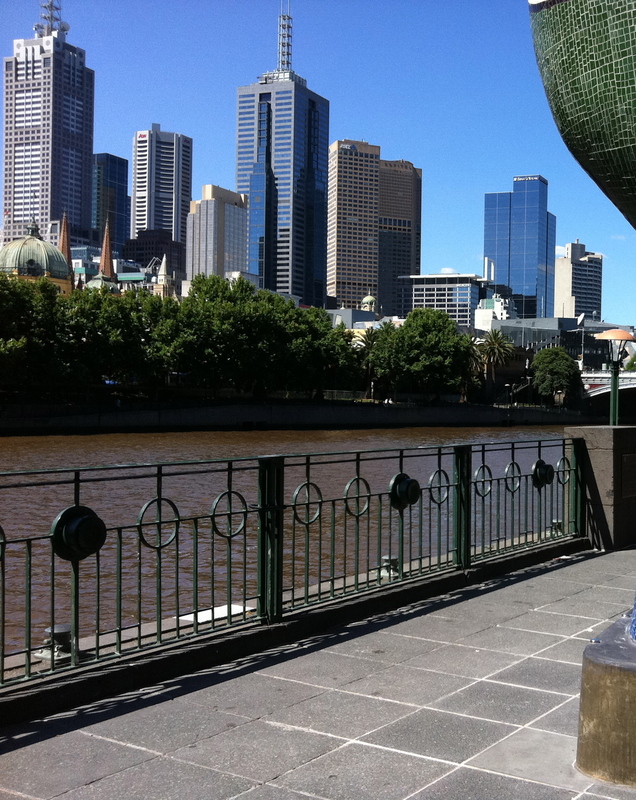 It’s a beautiful city, usually ranked in the top five world’s most liveable. When I first moved there, the old Gas and Fuel Towers still stood at the entrance to the city, two huge brown sixties monoliths blocking the view in all directions, a misguided planning decision if ever there was one. This seemed to be a general consensus because, soon after I arrived, the towers were demolished, opening up the cityscape once more and leaving a large building site designated for a mixed-use public space. A competition was held, designs submitted, and a winner chosen. Melbourne is a city that embraces modern architecture, sculptural cutting edge buildings standing next to crenellated Victorian masterpieces – just about every style of architecture since the 1850’s can be seen on its wide streets. What the city wanted was a new architectural icon, something to rival Sydney’s Opera House. So the new design, with its eco-friendly elements and exciting use of glass and metal, was seen as a clear favourite. Except, when they started building it, people didn’t like it. We were living across the road from the site at the time and would routinely curse the builders. Pile driving started at 7am even on weekends, plus the constant clatter and scream of concrete cutting and metal assembly echoed off the buildings and along the brown winding river. The emerging buildings looked like tin sheds crumpled by some giant’s hand and then dropped haphazardly across the coveted riverside site. There were complaints that some of the elements would block views of the Cathedral, and so the plans had to be changed. Everyone wondered why it was costing so much and taking so long to build. Then it was finished. And we went along to have a look. I still cannot say that I love the exterior, even though it features in some of my wedding photos. Yet the inside was a revelation. Soaring spaces, angles and glass, small windows framing snapshot views of the city and river. The buildings house museums, offices, galleries, shops and restaurants, while the sweeping plaza with warm stone cobbles and stepped layers is perfect for meeting, or just lazing with a cool drink on a hot Melbourne day. 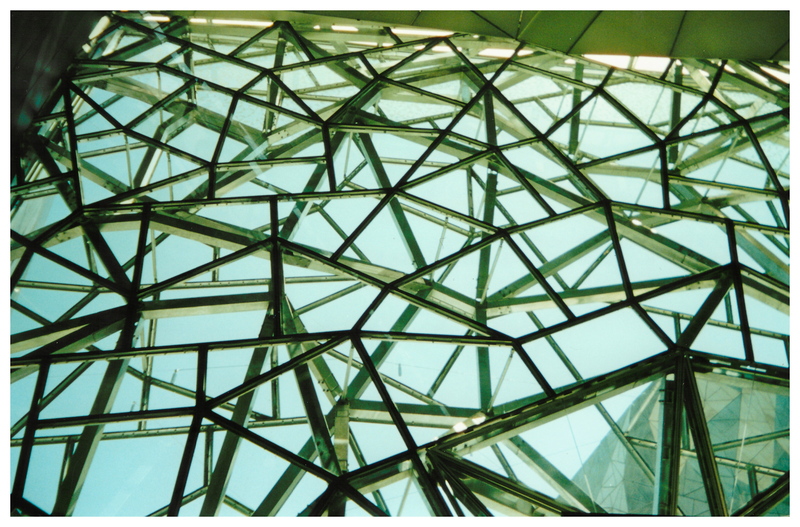 Federation Square is now almost fifteen years old and, while I don’t think it compares to Utzon’s Opera House for sheer visual impact, I do think it has a charm that is not immediately apparent. And that, perhaps, is what makes it quintessentially Melbourne. Unlike Sydney, where harbour and bridge and scenery hit you straight away, Melbourne is a city of layers. Of hidden laneways and after hours clubs, leafy homes and rambling parks. And so perhaps this design was the most appropriate, after all. 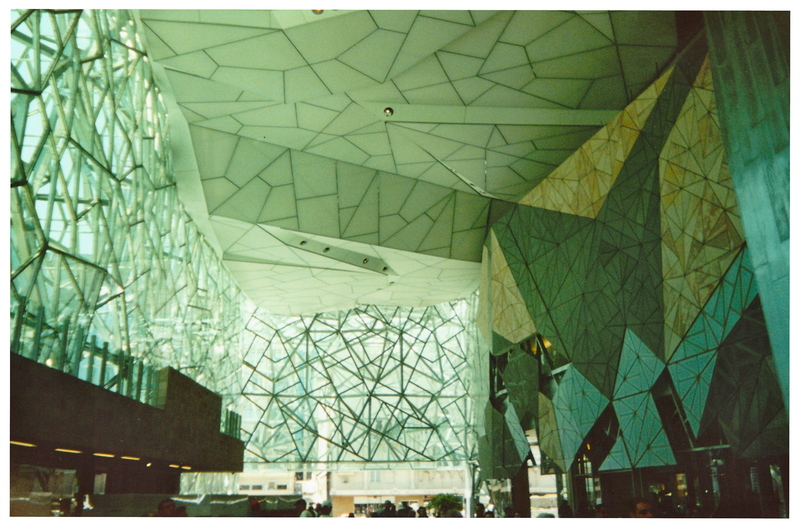 Thank you for joining me on another Wednesday Wander – if you’d like to know more about Federation Square, clic k here. See you next week! What a beautiful place to have a wedding! Thanks! We were married nearby at Melbourne Town Hall, so ended up going to the Square for pictures 🙂 I did go to another wedding held in the Square itself, which was a great night! I want to go there now!